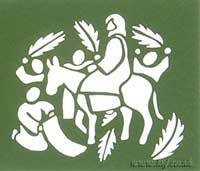 Jesus riding on a donkey with a crowd of people waving palm leaves in the background. A small laser cut card in a light weight dark coloured card when folded card is 105mm wide by 90mm high, comes unfolded. Tracing paper can be stuck behind and coloured in with felt pens or tissue paper used to create a stained glass effect.